Blogging is one way to share your expertise and—at the same time—build an author platform. 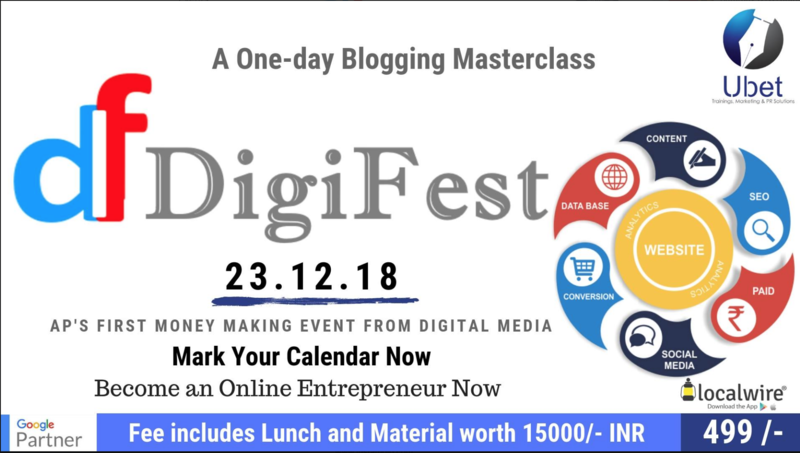 DigiFest Vizag will guide you through the entire blogging process—how to create and setup a blog, where to start, Earning from your blog, Maximizing your Affiliate sales and much more. You’ll learn how to attract readers and how to market your writing. Start a successful blog today and get noticed by editors and publishers. DigiFest Vizag is an Offline as well as an Online event organized by Ubet Solutions for the first time ever in Vishakapatnam. Being a multi-platform event(i.e both online & offline), people from all over India will be making way towards this event. - Free 35+ Coupons of hangout spots in and around Vizag. So why wait ? Start your career in blogging right away with Digifest.